Posted on April 11, 2019 by DanielC. Red Rising, written by Pierce Brown, was the last book that I finished before President’s Holiday. The story follows Darrow, a brave and loyal Red. Reds are the lowest “color” in the futuristic society of humans. The story follows Darrow’s adventures in becoming a Gold ( the highest ranking color) and destroying the rulers of the unfair Society form the inside. Once a Gold, Darrow goes to an academy where all other Golds attend. There, they learn to fight, command fleets, etc. Darrow hopes to graduate, become a well known and trusted fleet leader, and eventually destroy the Society. At the academy, the students are split into houses, each named after a Greek god. Then all of the houses are put against each other in an all-out war; the winning house will then graduate. In the end, Darrow’s house wins, and one of the most powerful leaders of the Society decides to train him in becoming a fleet leader. All in all, I thought that Red Rising was really good. There was a good mix of intense violence and strategy. The house wars reminded me of a mix of Hunger Games and Harry Potter. 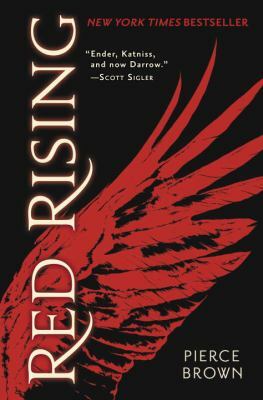 Currently, I am reading the sequel to Red Rising and it seems really good! Overall, I would rate the book a strong nine out of ten and would recommend the book to any middle schooler. The Red Rising series by Pierce Brown is available for checkout from the Mission Viejo Library. It can also be downloaded for free from Overdrive. This entry was posted in Uncategorized and tagged dystopian fiction, fantasy, trilogy by DanielC.. Bookmark the permalink.